Surprise Your Sweetheart this Valentine’s Day and get FREE Abdallah Chocolates with your order! Order online or call to order by February 8th. We’ll deliver your Valentine’s Day flowers on February 14th! *Available on orders $30 or more. Click here to shop online or call 507-637-2943! Join us Saturday, December 1st, 2018 for our annual Holiday Open House! Stop in for refreshments and drawings and browse the latest trends in holiday decorating and gift giving ideas! Join us for a fun Spruce Top Container Workshop on Saturday, November 17th at 10:00 a.m. Cost: $30 Includes pot, dirt, toppers and mixed greens. Location: Blossom Town Call 507-637-2943 to RSVP to attend! Limited to 20 people. Everyone is invited! 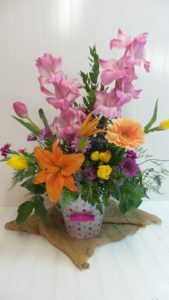 Mother’s Day: We Have What It Takes To Make Mom Smile! How to Deer Proof Your Garden!